A new edition of the long-sought-after co-op game where you and your friends run a real-time Chinese restaurant! The restaurant business can be a cutthroat one and new ones spring up every day, disappearing after only a short time - only the lucky (and hardworking!) few will stick around, and you want to be part of that illustrious group! In three short days you'll need to pay your rent to the bank, so expand your menu, get the customers turned around and out the door, then count up that money... Just make sure that you've got enough to make rent! 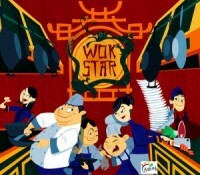 Wok Star is a cooperative real-time game where players take on different roles to help grow a Chinese restaurant in a tycoon style game. The clientele of customers is represented by a deck of cards with various Chinese dishes on them. Customers are served one at a time while a 20-second sand timer is running. If they are not served in time, they eat free. Each order requires a combination of ingredients to make. The board is used for tracking the levels of ten prepared ingredients in the kitchen. To prepare more ingredients, players spend dice in different combinations. All players are in charge of different tasks and all working simultaneously because the timer is running! At the end of each round, players pool their money and invest in different options to grow their business: new recipes, upgrade preparation cards, or advertise to get more customers. The players must have a certain level of profit by the last round to keep the restaurant open and win! I think that this game is great for family time as it is a cooperative game that is fast paced! There are lots of different ingredients that we haven’t used because we try to reach the goal, and can barley make enough ingredients for the menu we already have. I wish there were more dice but other than that it is in my top 5 favorite games list. If players were allowed more dice, or you made more ingredients per dice, I feel like the game would be more satisfying. Other than that you can set it to easy, regular, or pro which all have different time limits per card, which is nice because once you have the game down, its adds a new level of heat and excitement! This game is really fun. Theres a timer which keeps the game exciting and you work constantly, trying to meet the demands of the customers that come through your door. While there is a strategy that you are able to pick up if you have played the game and crunched the numbers and stuff, its still really fun to play provided you don’t mind the stress of the timer. In a two player game, this game is really excellent. Its incredibly difficult even on the easy setting where you have 30 seconds per customer and I’ve personally clocked in a 20% win rate as i play with my girlfriend. Played with 4 people, the game scales and actually gets much easier but still requires great teamwork especially as you reduce the time to about 15 seconds per customer. All in all, this game is really fun and recommended if you like working under time pressure and you don’t like the game to take really long as everyone is working together to ensure the survival of your restaurant. Add a Review for "Wok Star (Second Edition)"